We 3 Kings & Queens! 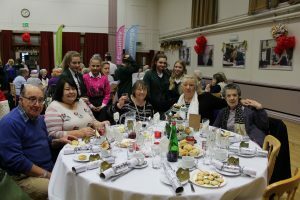 With the help from year 8 pupils from Therfield School, we were able to host a Christmas tea party for nearly 100 older Leatherhead residents just before Christmas. Many departments helped to make the afternoon a success. 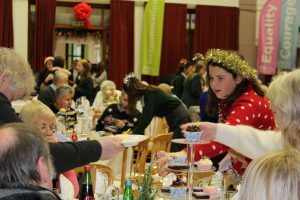 As well as pupils baking cakes and making sandwiches, the art department contributed table decorations, the school guitar group opened the entertainment, which also included an excerpt from A Christmas Carol by the drama team, and the school orchestra and choir ended the festivities with communal carol singing. It was wonderful to see the generations interacting so well together. 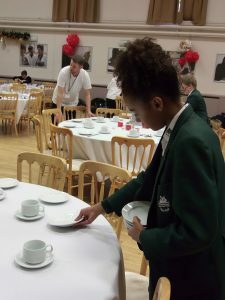 “Some of the year 8s were really apprehensive at the beginning of the afternoon,” said Miss Mc Arthur, Head of Year 8, “but by the end of the tea everyone was chatting away to the guests on their table. I’m so proud of them all!” It was clear that their guests appreciated the hospitality too. 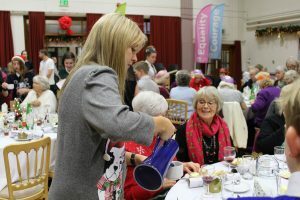 The tea party coincided with the release of the Jo Cox Commission report on loneliness, in which Age UK stated that ‘For 3.6 million people aged 65, television is the main form of company’. Similarly, it’s important to be aware that many young people can experience problems with loneliness. 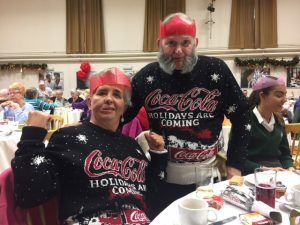 Simple community activities, such as the ‘Kings & Queens’ events help people of all ages to connect providing opportunities to develop new skills, boost self-esteem and improve mental health of all those involved. 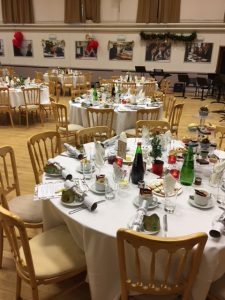 Headteacher, Mr James Malley stated that he would like to see the Christmas tea party become an annual fixture in the school calendar. He considers community engagement plays an integral role in improving student learning and building a stronger local community. 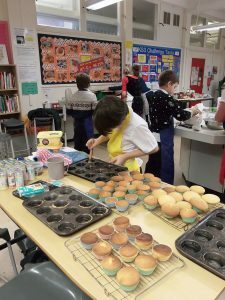 It was fantastic to partner with the Leatherhead Youth Project and Therfield School to host such a great event and with huge thanks to the Leatherhead Community Association and Clarion Housing for funding it. It was a follow up to the successful Kings & Queen’s event held in the Kingston Road Recreation Ground last May. If you enjoyed reading this news then why not share it? You can donate good quality clothes and toys directly to the B@titude shop. Any clothes we feel cannot be sold are recycled for textiles, helping reduce environmental waste or the clothes are exported to less developed countries. If you feel you would you like to support B@titude financially please use Givey by clicking here. This can be used for one off donations or to create a fundraising page. Otherwise for monthly contributions please get in touch for a standing order form. If you have a stewardship account then please search ‘B@titude Limited’. Volunteer help is always needed and is vital for the continued running and development of the shop. We’re always looking for help with sorting and steaming clothes, making teas and coffees and keeping the place looking clean and tidy.